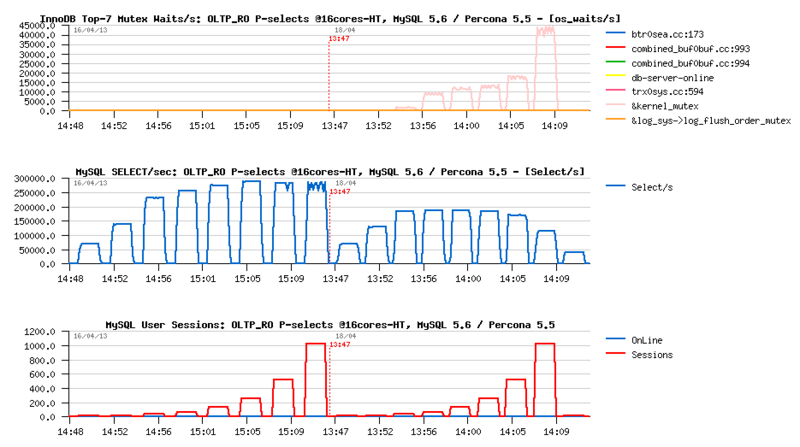 MySQL Performance: What are your top-5 performance issues?.. 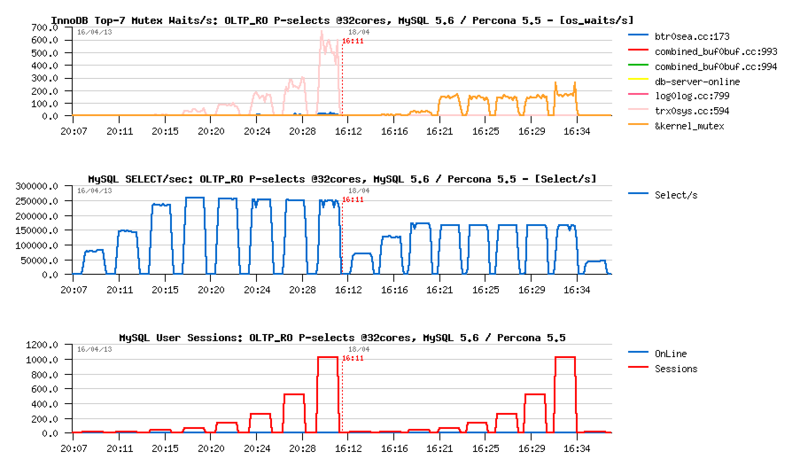 I have a talk about MySQL 5.6 Performance related stuff during Percona Live (this Wednesday, 24 April 2:00pm - 2:50pm @ Ballroom A). But my main interest during this Conference is to exchange with you as much as possible about what kind of performance problems you meet generally and what are your top-5 performance issues in MySQL workloads you have today right now? (ordered by priority).. While you may also left a comment about your top-5 issues here, and then let's talk about.. This article inspired by benchmark results published by Alexey @Percona related to the "trx_list" modifications came with latest Percona Server 5.5. I was particularly curious about this feature, because the exactly the same solution was rejected by Sunny two years ago while analyzed this kind of problems (described within presented bug report and others).. But well, one real test result is better than many discussions, so let's see what kind of results I will get on my own server. I'll test the same OLTP_RO Point-Select workload using 8 tables (by running 8 Sysbench processes in parallel). I'd say that this kind of load was initially pretty problematic for MySQL 5.6, as queries here are very short and running particularly fast. So, the idea of Read-Only transaction feature coming in 5.6 initially because of this workload, before being useful in other cases as well. Percona Server is reaching near 200K QPS here (seems like my server is not as fast as tested by Alexey to show higher QPS)..
while MySQL 5.6 is not far from 300K QPS within the same workload..
or probably we will have more details once Percona will release their 5.6 code tree? - let's see..
Now, let's bring to the same picture also MySQL 5.5 and MariaDB 5.5.
while MySQL 5.6 is just out-passing them all.. Regarding the test case #2 (when transactions are used) - well, nothing surprising in results, because it was exactly the reason to have Read-Only transactions feature, right? ;-) However, I may say you now that in the next MySQL 5.6 release the code is discovering "auto-magically" Read-Only transactions (in fact any transaction is considered Read-Only until it did not involve any writes, and switching to a "normal" transaction model as soon as the first write was involved).. - just wait little bit before the code is published.. 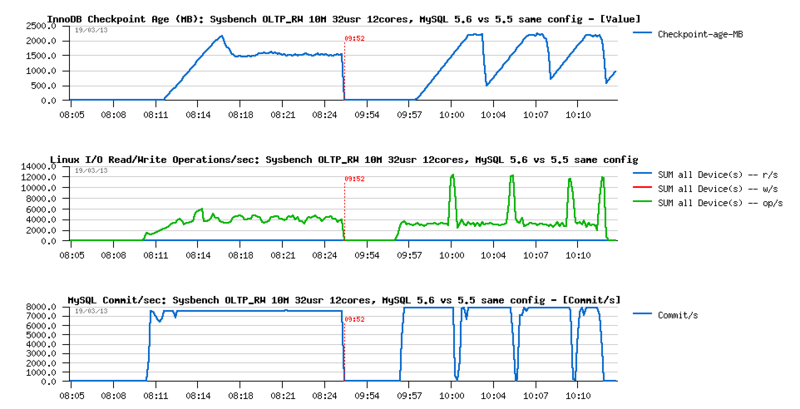 This article was inspired by problems on low level workloads initially reported by Peter Zaitsev (Is MySQL 5.6 is slower than 5.5?, and then Why mysql performance at low concurrency is important) and Mark Callaghan (MySQL 5.6 single-threaded read-only, MySQL 5.6 single-thread update-only, MySQL 5.6 - incomplete perf-guide..)..
Of course the "low level" performance is important and remains significant. And "small servers" performance too. In many cases people supposing they have a heavy load because there are observing hundreds or thousands "active" connections, while in reality only few of them are truly active on the same time, and concurrency level is much lower than initially supposed.. Such workloads may remain near free from any internal or external contention, and have performance level depending only on the pure code path overhead.. I'll start first with Read-Only tests (Sysbench OLTP_RO, which is used so often), as this test case is the most simple and really only few factors coming into the game. What is important here... - single user (or single thread) workload is completely free of any possible or potential contention, so if there is any difference in execution time, then it represents a pure overhead (coming from "somewhere").. Now, if we're comparing MySQL 5.6 with 5.5 (and yet with 5.1) we have to keep in mind that there was no fundamental changes made between them to improve the code path itself. MySQL was lacking "must have" features that people needing in production, so every new release came with a bigger code (means more and more longer code path).. - so just from a "common sense" single user performance cannot be better on MySQL 5.6 than on 5.5 (and not on 5.1 which is even not having MDL code).. But well, this is still yet a half of the problem.. - the main problem for me is that single user OLTP_RO is giving me completely different results from run to run (same test, same config, same HW - but different results from run to run).. Thing are going so fast on OLTP_RO workload once all the data are cached by InnoDB Buffer Pool, then performance result becomes depending on many small things (CPU cache, RAM latency, etc.).. So, when on the same run without any changes you may already get 3% difference, it becomes even harder to understand if some applied new changes will bring you real improvement or additional overhead.. However, we may expect a better stability when we're observing more concurrent sessions running, right? - so, on the following example I've started with 8 concurrent users. transaction clauses are not used..
then MySQL server restarted again, pre-warn and the same 3 tests executed again..
and all these 3 times too, so in total we have 9 test results which are expected to be "near the same", right?.. you can see that 5.6 results are in range of [65489 - 69030] QPS..
and 5.5 are in [69577 - 72015] QPS..
however, if you're really unlucky and in your test series will match the worse time of 5.6 and the best time of 5.5 then you'll observe 10%(!) regression from 5.5 to 5.6..
which is giving us 5.8% performance regression comparing 5.5 to 5.6 on 8 user sessions.. - pretty strange how it was possible that such a difference escaped from our QA tests, because our "red line" there is around 3% (and every test is executed 3 times) - probably we were just little bit more lucky here, etc. 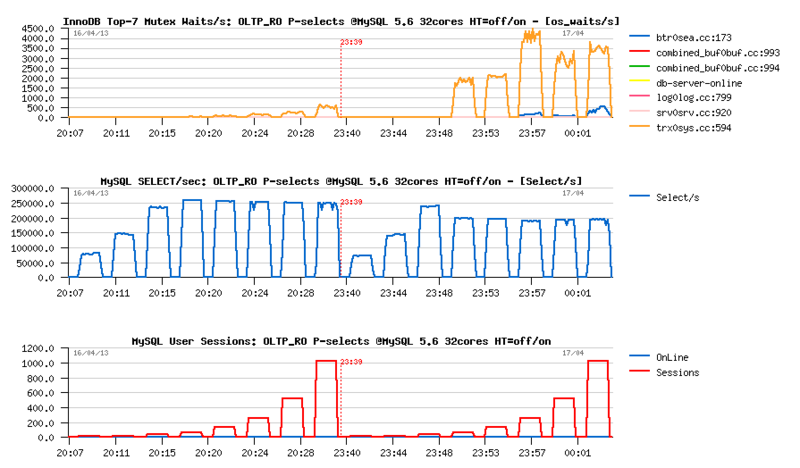 - don't know..
both results are slightly worse than expected (yes, "perf" tool also has its overhead, not only MySQL stuff ;-)), however the result is the result, and there is really 10% difference happened during these tests under profiling, so we should see something pretty visible and big in profiler reports, right? (well, at least expect to see finally something and then at least to know what to fix)..
you can see that the most hot function here is my_hash_sort_simple(), however there is only 8.4% difference between 5.5 and 5.6 here, and only 0.90% of "pure weight"..
while there are function going up to 88% in difference, like trx_start_low(), but having only 0.19% in weight..
so, from where the main difference is coming?.. Now, you can also see that on some function were spending less time in 5.6 than in 5.5, so what if now I inverse the comparison and will get a report on diff 5.6 vs 5.5 (instead of 5.5 vs 5.6) ?.. while it's till 5.5 which is running faster!.. and the sum weight in 5.6 vs 5.5 is finally 5.10%, which is comparing to 6.67% in 5.5 vs 5.6 is giving only 1.57%..
as you can see, it'll be very hard to find something there..
Looks like the best "potential" candidate is still my_hash_sort_simple() function, because improved time on this one will at least be very visible as it represents 10% of the whole execution time.. But then, would you refuse this gold mine of information which is proposing you PFS today in exchange of 5% in QPS?.. - Seems to me I have to present you some more detailed stuff here about every potential overhead in PFS to break last doubts if any ;-)) -- and don't forget that more you test PFS and report your problems - better it will be! Let's get a look now on the OLTP_RW (Read-Write). while there are still some areas in 5.6 which should be improved (see: Heavy I/O RW workloads limits in 5.6 - and work is in progress here, stay tuned)..
and to keep things stable, we're writing slightly more (as you can see from I/O activity graph).. 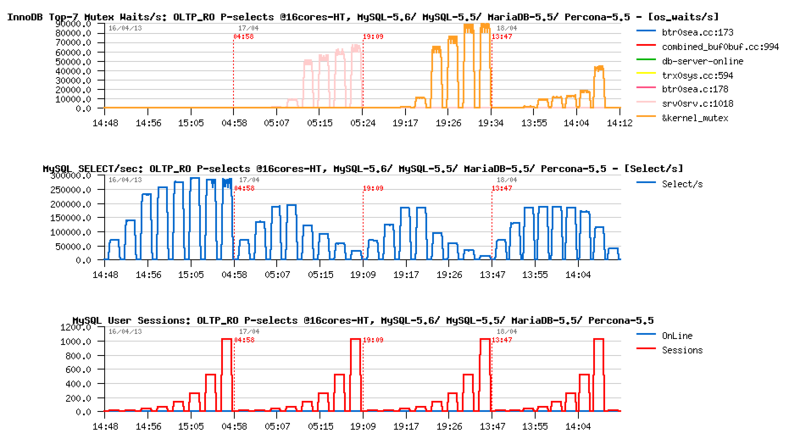 While, of course, on a bigger server this workload will run way better on MySQL 5.6 (as you can see from the previous posts). Let's now go more in depth, but with a bigger server - my lovely 32cores host. What is good with a bigger server that we're able to simulate small one with it as well, but have a room for different test configs ;-) By binding MySQL server and Sysbench binary to 8 or 16cores we may observe less or more what we may expect from an 8 or 16cores server.. NOTE: for the following tests MySQL binaries were compiled with PFS instrumentation, but PFS was turned off during the tests. but 5.6 is still worse than 5.5..
pretty similar barrier is here too..
MySQL 5.6 showing here a direct speed-up if you have 16 (or more) CPU cores on your HW server and at least 16 concurrent user sessions..
in any case, even on a small server, you'll still get a benefit of the all other performance improvements coming with MySQL 5.6 (ex: stable writes, binlog group commit, etc. etc. etc. - the most complete lists by Rob and Peter)..